Steel Platform also named steel structure working platform. Modern steel structure have various of different structure to suit for different situation. 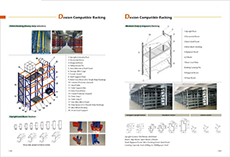 The most advantage is fully dismountable structure, the structure is widely used in modern storage system. Steel Platform is made from special steel like H steel. The major components includes column, beam and steel floor. All the parts can be connected with bolts & nuts. 1. Light duty steel platform and heavy duty platform. 2. Independent steel platform or racking structure platform. 1. Steel platform have high steel rigid with low self weight. It can be used for long span and heavy cargo. 2. The delivery time is very short. As all the components are made from steel, thus each part can be manufactured separately. 3. Steel platform have various structure for different situation, it fit for different warehouse size and condition.